For those not in the classical know, The Cleveland Baroque Orchestra known as Apollo's Fire is a popular and critically acclaimed period-instrument ensemble specializing in early music based in Cleveland, Ohio. The ensemble unites a select pool of early music specialists from throughout North America and Europe. Jeannette Sorrell is an American conductor and harpsichordist and the founder and musical director of Apollo's Fire. 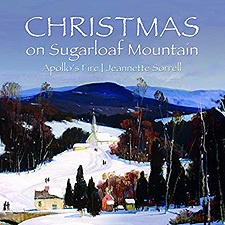 Following the release of the award-winning Sugarloaf Mountain: An Appalachian Gathering, which was a Top 5 Billboard Classical Crossover hit, Jeannette Sorrell and Apollos Fire present Christmas on Sugarloaf Mountain. In this celebration of the American immigrant experience, fiddlers, medieval harp, hammered dulcimer, bagpipes and singers join with children's voices to evoke the Celtic roots of an Appalachian Christmas. From Christmas Eve in medieval Scotland to folk carols and shape-note hymns at a toe-tapping Christmas gathering in Virginia, Apollos Fire follows the journeys of the Irish and Scottish settlers who bravely crossed the Atlantic, settled in the mountains and welcomed Christmas with love, singing, dancing and prayer. Admittedly, I don't usually listen to Christmas albums before Thanksgiving, but given what I do for a living, that's sometimes out of my hands, of course. The stunning bonus track 'The Parting Glass' rounds out the album perfectly, giving the album a sense of accomplished purpose for those that wish to play it come their very own Christmas morning.